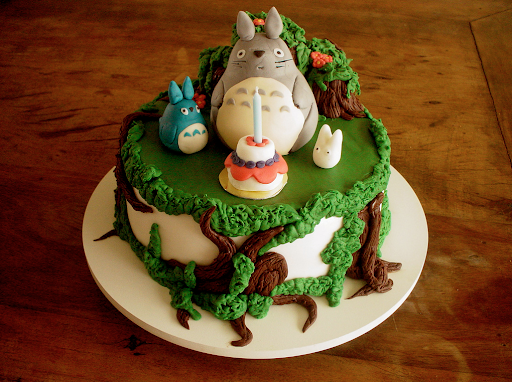 Today, I wanted to share this cute Totoro cake for inspiration. My sisters and I grew up watching Tonarino Totoro (My Neighbor Totoro) over and over. We would sing, dance and pretend to be characters from the movie. What can I say, we loved it! So when my sister came back from Japan and got me a few CDs of classic Japanese children's songs, I was super excited when I heard the Totoro theme song (instrumental version) on one of them. The one we have actually has the lyrics but it's beautiful either way. I've been playing it on a daily basis for Bruce to listen to and he falls asleep or stops crying when this song comes up. :) It puts me in a good mood too!